Regular vacuuming and dusting of your car's interior is the best way to keep it looking good. Regular interior maintenance is EASY maintenance. However, surface cleaning alone is not enough. Two to three times a year you will need to detail the upholstery to keep it looking its best. 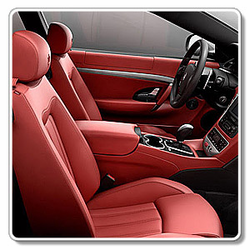 Warning: Before using any product on your car's fabric upholstery, carpet, leather or vinyl, test for color fading by cleaning a small, inconspicuous area. Do not use the product if it adversely changes your fabric's color or texture. The interior of this BMW has just been perfectly detailed. Notice how the leather has a nice, even matte finish. Professional detailers don't leave a car's interior looking wet and slick. The interior should look like it just arrived from the factory. There's no special science to car vacuuming. You need a good vacuum, a few attachments, and ten to fifteen minutes to get in there and get the job done. A special car vacuum, such as this Vac 'N Blo Portable Vacuum from Metropolitan Vacuum has all of the right attachments for car detailing. This car vacuum is under 18" long and only 7" in diameter. It comes with a 12' power cord, a shoulder strap, a 6' flexible hose, two 20" extensions, a blower nozzle, pik-all nozzle, dust brush, crevice tool, inflator adapter and a 4-piece microcleaning tool kit. The two most important attachments are the crevice attachment and the dust brush attachment. Make sure your crevice attachment is plastic, not metal. A metal attachment or a plastic attachment that's in poor condition may scratch or otherwise damage leather or vinyl upholstery. Start your vacuuming job by pulling out the floor mats.� Shake out the mats to remove any loose dirt.� Use a 4" upholstery attachment or the bare hose end to vigorously vacuum the mats. The more you’re able to agitate the carpet, the cleaner you’ll get it. Work on the rear upholstery and carpet. Push the front seats all the way forward. Use the crevice tool to vacuum the cracks of the seats, and between the seats and carpeted areas. If the seat upholstery is fabric, switch to the 4" upholstery attachment and vacuum the rear seat and the deck under the rear window. Vacuum the rear carpet. Use the crevice tool to vacuum around the seat tracks and under the front seats. Use the round dust brush attachment to vacuum the door panels. Push the front seats all the way back to work on the front upholstery. Use the crevice tool to vacuum the cracks of the seats, between the seats and carpeted areas, and around the gas and brake pedals. Now switch to the 4" upholstery attachment to vacuum the carpet in the foot wells and the seats (if the seats are fabric). Use the Auto Vent Brush to vacuum the console, vents and door panels. We look at the dashboard and console more than any other area of our car's interior. It makes sense, therefore, that we should give it some special attention. The dash and the deck under the rear window also take the brunt of damage from sun exposure. In order to keep your dash from cracking and fading, regular treatment is necessary. Caring for the dash and console is really pretty easy. Simply wipe them down with a damp Blue SilverClean Interior Detailing Towel every time you wash your car, and treat them with a vinyl protectant once a month. To reduce the effects of the sun's UV rays, use products like BLACKFIRE Interior Protectant, 303 Aerospace Protectant or Ultima Interior Guard Plus, which contain protective UV sunscreens. These protectants create a perfect satin finish. The easiest way to treat the dash and console is to use a foam applicator pad. Spray your vinyl protectant directly on the applicator, not on the dash or console, and wipe it in thoroughly. This will prevent overspray on your glass and upholstery. Don't forget to protect the steering wheel, turn signal levers and the shift boot. Allow the vinyl protectant to soak in for 3 to 5 minutes, and then buff the dash and console dry with a Blue SilverClean Interior Detailing Towels. If you're doing a complete interior detail, you should also dust and clean out the vents and grillwork. There are a variety of tools that work in vents and grilles. Use the Interior Concours Brush and compressed air. If you don't have compressed air, you can use the blow cycle on your vacuum. For heavily soiled interior surfaces, use Optimum Power Clean All Purpose Cleaner before agitating with the Mat & Carpet Scrub Brush. If you have a Dual Action Polisher, you can use a Carpet & Upholstery Brushes for Dual Action Polishers. On consoles with a lot of nooks and crannies, it's best to use a soft bristled brush followed by a towel to clean and protect. This same method works well around buttons and controls on the dash. Aerosol products like McKee's 37 Trim Detailer also work well in detailing areas and spots where your towel and finger can't reach. Thoroughly clean around door handles, pulls and window cranks, using a soft detail brush and interior cleaner. Be sure to clean and dry the speaker grilles and the wells on armrests, too. If the door panels have storage pockets, use your sponge or wash mitt to clean in these areas, as they tend to collect a lot of dirt and crud. Next, use your sponge or wash mitt and interior cleaner to clean all the way around the door frame and the doorsill. When you're finished, dry the door completely with a clean drying towel. If your door panel is leather or vinyl, be sure to treat it with a leather or vinyl protectant. Fabric door panels can be treated with a fabric protectant, like 303 Fabric Guard, to reduce staining and fading. Even if lightly soiled, it�s always a good idea to use an interior cleaner like Kenotek Interior Cleaner first, this way the panels are prepped for a protective coating. 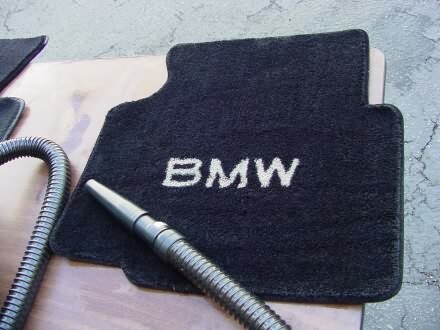 Keep in mind, you can use leather cleaners on vinyl, but I would not use a vinyl specific cleaner on leather. Combo products like Pinnacle Leather &Vinyl Cleaner are safe on both surfaces. DO NOT use regular household soap and water on your vinyl and plastic surfaces. Detergent will permanently remove the sheen from vinyl and plastic. Choose a cleaner made specifically for interior surfaces. One of my personal favorite is Britemax Interior Cleaner Multi-Surface Cleaner, which is a quick spray-and-wipe solution that does not require rinsing. It's also safe on all interior surfaces. For dirtier panels, some agitation may be required to loosen grime. 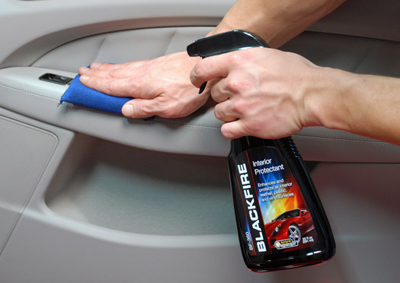 Apply a dressing like BLACKFIRE Interior Protectant to all vinyl and plastic surfaces to protect and beautify. It is important to use a product containing UV protection to prevent fading and severe damage. Wipe off excess dressing. The finish should have a nice clean look. For premium protection, use Pinnacle Vinyl & Rubber Protectant. This amazing product offers amazing protection and a satin finish to vinyl and plastic. A quick word about vinyl dressings: they�re not all the same. Choose a dressing that gives you the look you want (flat to shiny). Wolfgang Cockpit Trim Sealant creates a matte finish, whereas McKee's 37 Interior Surface Protectant creates an attractive satin finish. Ultima Interior Guard Plus has the unique characteristic of taking on the original surface finish. So, when applied to a matte finish, Ultima Interior Guard Plus looks flat and applied to a glossy finish, like wood trim, Ultima Interior Guard Plus takes on a high gloss finish. Another thing to consider is protection from the sun. All of the products mentioned above offer great UV light protection. Spray spots and heavily soiled areas with a good spot remover. I recommend a product like Wolfgang Spot Eliminator or Dakota Fabric Foam Carpet & Upholstery Cleaner. If you're not working on a warm, sunny day, use a hair dryer to complete the drying process. Be careful not to scorch the carpet by holding the dryer too close. To keep your carpet and floor mats looking great, use a fabric protectant like 303 High Tech Fabric Guard. It's really cheap insurance against spills and stains. Most of us spend 8 to 15 hours a week inside our cars, so it makes sense that we should keep them neat and tidy. Yet finding the time to detail the inside of the car is difficult with our busy schedules. If you take just five minutes each time you wash your car to remove the trash, shake out the mats, and wipe down the dash, console and seats, you can stay on top of this detailing chore. Then when it comes time for a full interior detail, the task will not seem quite so daunting. Clean up that Dirty Carpet, Upholstery and Vinyl! Cleans and removes every sign of winter from your interior. Ultima Interior Guard Plus, 12 oz. Long lasting interior conditioning & protection. Don't make the mistake of using a generic detailing brush to make your car's interior sparkle!